MIX TOGETHER THE SEASONING -AND SET ASIDE. ANY EXTRA SEASONING CAN BE STORED IN AN AIRTIGHT CONTAINER. RINSE AND PAT DRY THE DUCK BREASTS. TURN THEM FAT SIDE UP AND SCORE THE FAT, BOTH HORIZONTALLY AND VERTICALLY. LIGHTLY SALT & PEPPER THE BREASTS AND RUB A PINCH OR TWO OF THE SEASONING INTO THE TOP-FAT SIDE AND THE BOTTOM FLESH SIDE . PLACE THE DUCK BREASTS, FAT SIDE DOWN IN AN IRON SKILLET AND HEAT ON THE COOKTOP, OVER MEDIUM HEAT, FOR ABOUT 8 MINUTES UNTIL THE FAT IS CRISPY AND BROWN. POUR OFF EXCESS FAT FROM THE PAN, TURN THE BREASTS OVER AND POUR IN 1/4 C OF THE APPLE JUICE. PLACE THE PAN IN THE OVEN AND COOK FOR ABOUT 12 MINUTES. REMOVE THE PAN FROM THE OVEN AND ADD THE REMAINING 1/4 C OF APPLE JUICE. REST THE DUCK FOR 5 MINUTES. THINLY SLICE THE BREASTS AT AN ANGLE AND SPOON A LITTLE OF THE JUICE FROM THE PAN OVER THE DUCK. 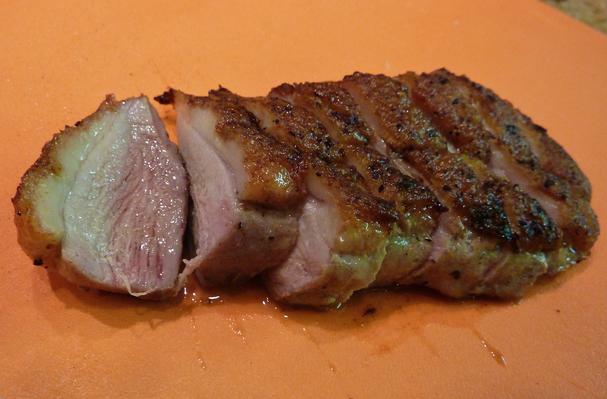 There is nothing that smells or tastes better than a simple duck breast. It may seem an intimidating dish to make, but it couldn’t be easier. Unlike chicken- duck should be served just a little pink.